Reginald was born in Heaton on 1 October 1887, the illegitimate son of Ciceley Brocklehurst who was a farm servant. 1891 finds Reginald living with his great uncle Joseph Cundiff at the Ship Inn whilst mother is still a farm servant, now at Hilly Lees, Swythamley. Ten years later he was living elsewhere in Danebridge (either The Villa or Lilac Cottage) with grandfather David Brocklehurst and grandmother Helen, sister to Joseph. Also in the household at that time are his Uncle George, a postman, and Aunt Harriet, both single. Ciceley meanwhile had married and was living in Handforth with two more children. By 1911 Reg was working as a general labourer and living in the Villa with Uncle George, who was now married to Emma Bateman. Some locals thought Reg was an orphan, perhaps because his aunt Hannah Brocklehurst had died in 1889 and it was assumed he had been her illegitimate son? 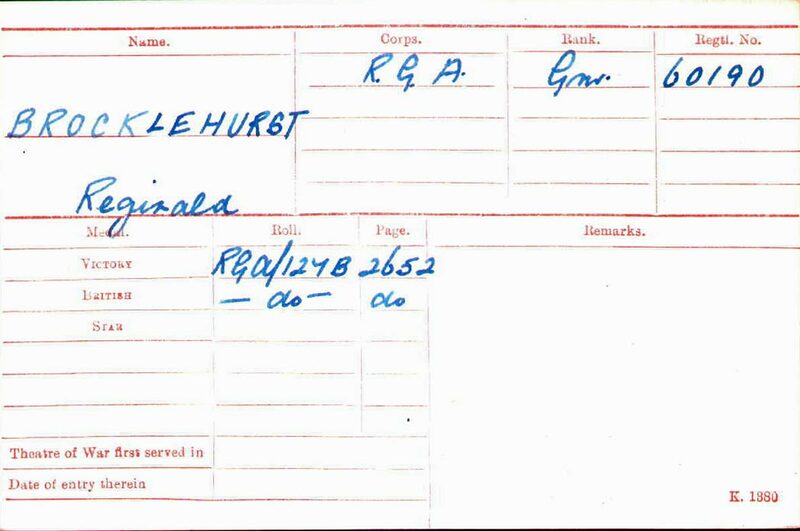 The Absent Voters List tells us he was in the Royal Garrison Artillery, regimental number 60190, during the war (as were several other men from Wincle) and his medal index cards suggests he was not called up before 1916. We have no further information about his time in the forces. After the war he worked as a gardener at Bagstones. He remained with his uncle and aunt at the Villa until his death on 11 Nov 1942 in Wincle. He was buried there with his great uncle Joseph and Aunt Eliza and their little daughter.